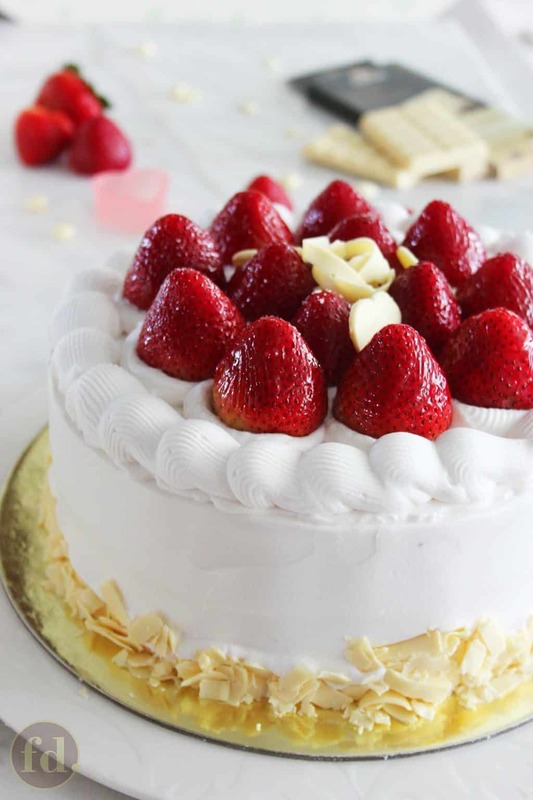 Japanese strawberry shortcake is an ethereally light and creamy dessert made of deliciously moist and fluffy sponge cake layers, filled with sliced strawberries in Chantilly cream. 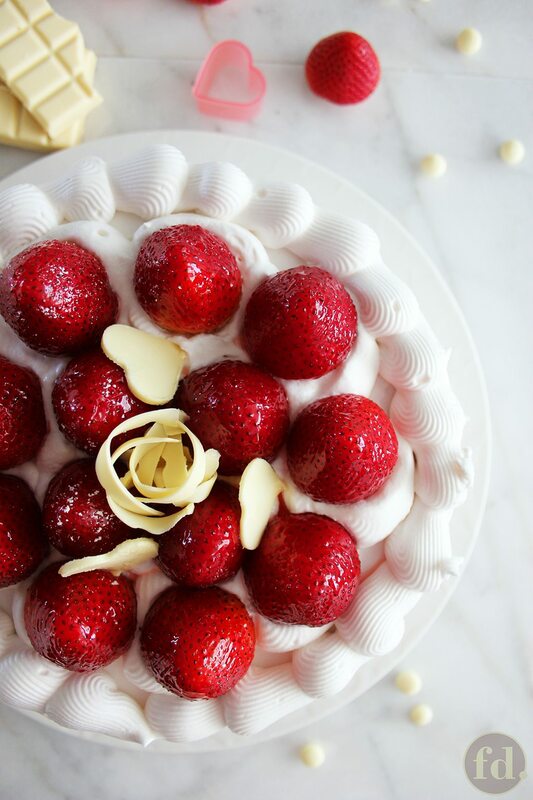 Decorate with luscious whole strawberries and cream – and – for that extra special yummm, sprinkle lavishly with white chocolate curls! My, oh my! Has it been over three months since I’ve posted anything??? I’ve been super busy, life has been super hectic, but here’s the icing on the cake, I’ve been doing really great with stuff that stokes my passion! March saw me busy with culinary courses. April and May came, and whoosh… a lot of birthdays happened and quite unexpectedly, I found myself swept off my feet with festive baking, experimenting with wonderfully creative and decorative elements that went into making celebration cakes. Then I was off to Japan for 15 glorious days for the better part of May! Now, I’ve returned feeling invigorated and so tremendously inspired by all the Japanese culinary creations of traditional and Western-inspired sweet treats, cakes and desserts. It was mind-blowing! But I’m sticking to just cakes, because that’s all I’ve been thinking of since I arrived home. Not just any cake, but a Japanese strawberry shortcake. I might be forgiven for thinking that the Japanese strawberry shortcake is probably the most popular cake in the country, because everywhere I turned or looked around in the city, these pretty red and white, strawberries and cream dessert can be found at almost every Japanese cafe, bakery and food market. As a Western-inspired dessert, it could probably pass off as the country’s national dessert due to it’s immense appeal and popularity… that is, if I didn’t know any better! And really, how much more simple and fuss-free can this cake be? 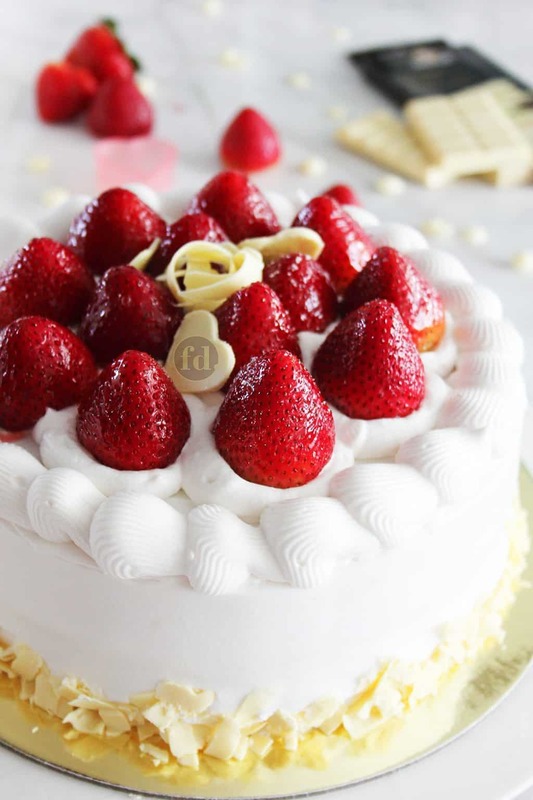 Essentially, the Japanese strawberry shortcake is a vanilla sponge cake that’s layered and filled with Chantilly cream and sliced strawberries, and frosted all around and topped with more Chantilly cream and decorated with whole strawberries. It’s ethereally light and creamy, and none too sweet, perfect for tea, any occasion or no occasion at all. But when I decided to make this cake, I did have a special occasion – it was my hub’s birthday – and let me just say, that for someone who’s never been keen on cream, this is the only cream cake I know that has my hub chowing down on plenty of cake and every streak of cream off his plate (I did use non-dairy whip topping cream instead of dairy whipping cream, more on that later…), after which came a final and fully-realised declaration that it was the best cake he’d ever tasted, and his absolute favourite. 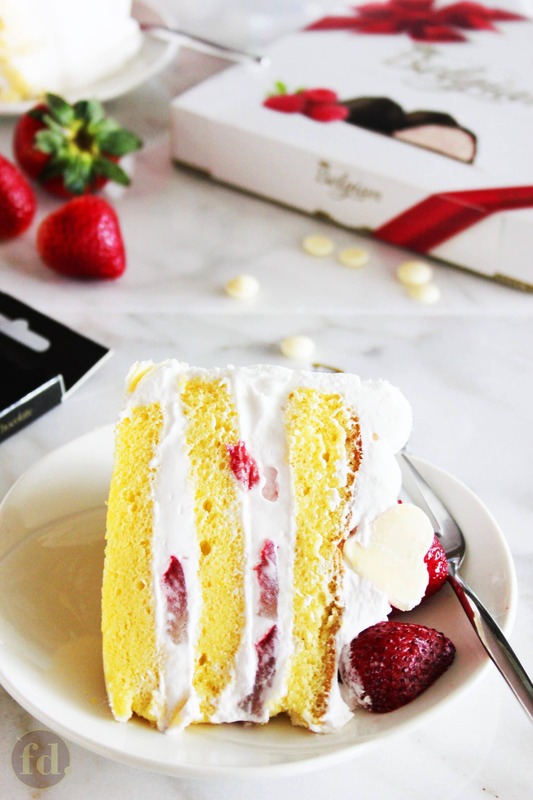 Now, the Japanese version of strawberry shortcake is extraordinarily delicious because of the incredibly soft and tender sponge cake, and sweeter-than-sweet Japanese-grown strawberries. Luckily, for those of us in tropical Singapore, we have easy access to quality strawberries from Japan, as well as Korea and the USA, so try to buy the sweetest variety you can at the price you’re comfortable to fork out money for – it will make all the difference! Okay, finding sweetish strawberries – I can handle and I’m sure you could too, easy peasy. Next, aaahhh…. the sponge cake! Not so easy at first for me…it’s not for lack of sponge cake recipes, but I wanted an extraordinarily delicious one for an extraordinarily delicious strawberry shortcake! I’d always relied on my favourite vanilla chiffon cake, which turns out a wonderful cake by the way, but the perfectionist in me was always aspiring for something more, something better. And then, just like that, as if to answer my prayers, sister-in-law #3 (I have 6) gave me this recipe, way back from the 1980’s or 1990’s. I won’t lie, I seriously had my doubts as to how good could this old recipe really be. But OMG, I couldn’t be more wrong, this is the best sponge cake I’ve ever made…and I mean it, the B-E-S-T! I’ve now made this many times over, and it’s absolutely a winner! This sponge cake is incredibly soft, very moist and so, so velvety-smooth on the tongue. It has just the perfect level of sweetness, which is not too sweet, so if you have slightly sweeter fruit fillings like canned fruit or berry compote, it will work out beautifully and you won’t need to fiddle with the amount of sugar in the recipe. The key to this sponge cake’s super soft and tender texture are the types of flour used. Most sponge cake recipes call for pastry flour or cake flour, but this recipe uses Optima flour (you can substitute with any brand of sponge cake mix) and Hong Kong flour. If you can’t get these flours in your locale, you can use cake or pastry flour and still get a tender and moist sponge cake, though the texture will not be as smooth. However, as Optima flour has sugar added into the flour mix (try sifting this and you’ll have granulated sugar left on your sieve), you may need to increase sugar in the recipe if you’re substituting with these other flours. Sponge cakes can be a little tricky, and more often than not, hit-and-miss, but they’re not tough nuts to crack. You just need to practise and hone your skills. I’d have to dedicate an entire post on this sponge cake recipe, which I promise is being put together as we speak. But here’s the gist – the key to a perfect sponge cake are to ensure that you follow the instructions precisely, measure all the ingredients exactly, learn to recognise when the egg whites have whipped sufficiently to stiff peaks (without over-whipping), and fold with a gentle and quick hand, always in one direction, repetitively scooping the batter from the bottom of the bowl and turning it over on top, like making the letter ‘J’, whilst turning the bowl so that you’re systematically mixing around the batter. Finally, what’s a strawberry shortcake without the luscious, light and airy whipped cream, huh? I mean, strawberries and cream has got to be one of the most wonderful combos ever in the desserts universe! Usually, I use dairy whipping cream (with at least 35% fat) but as of late, I’ve begun switching to non-dairy whipping cream for fillings, as well as for toppings and frostings. I love this type of cream as they aren’t as dense or heavy as dairy whipping creams, but are light and airy, which makes it the perfect type of cream to fill and dress up this light strawberry shortcake. Chantilly cream is essentially whipped cream, it’s just another name that sounds fancy! Whip topping creams are usually sweetened a bit (I like to use RED MAN brand), so if you prefer to use dairy whipping cream (30-35% fat), you will need to add some sugar (I’ve suggested the amount of sugar in the recipe for this). So, feel free to use dairy whipping cream if you want a rich and super creamy taste in your cake. Avoid using heavy cream (36-38% fat) or heavy double cream (48% fat), as this type of cream is very heavy and dense on your palette, and hence, not ideal for Japanese strawberry shortcake. I hope you’ll try this and share with me your thoughts and impressions of this ever popular Japanese-inspired cake! As always, I’d love to see your bakes, so do share your pics if you’re on Instagram by tagging @foodelicacy. Try this easy and very delicious recipe for Japanese strawberry shortcake! Includes a recipe for the best sponge cake you'll ever need - super moist, light and cotton-fluffy - filled and frosted with Chantilly cream and freshly sliced (or whole) strawberries. Pre-heat oven to 165°C (330°F) with baking shelf placed on the lowest rack in the oven. Do NOT grease the cake pan. In a medium mixing bowl, combine optima flour, Hong Kong flour and baking soda and stir with a whisk to mix well. In another mixing bowl, place egg yolks, water, vegetable oil, butter oil (or vanilla extract). Use a whisk to stir until well mixed. Sprinkle in flour-soda mixture from step (2), 1 to 2 tbsps at a time, stirring with a whisk to mix well, before adding more. Mix until mixture is smooth and free of lumps. Place egg whites and cream of tartar into a dry and grease-free mixer bowl. Using a hand-held or electric mixer fitted with a whisk attachment, whip on high speed until egg whites turn frothy. Sprinkle in the sugar a little at a time, and continue to whip until stiff peaks form. Add one-third of the whipped egg white mixture to the wet flour mixture from step (3), fold gently by hand with a spatula. Then add all the remaining whipped egg whites and fold gently, moving always in one direction, until well mixed. Pour out into prepared cake pan and level the surface. Gently tap the pan on the counter a few times to eliminate air pockets. Bake at 165°C (330°F) for 50 to 60 minutes, or until done. To test: (a) Insert a skewer into the centre of the the cake, it is done when it emerges clean and free of sticky batter; AND/OR (b) press your fingers gently on the centre, the cake is done if it feels pillowy and springs back to the touch; AND/OR (c) insert an instant-read thermometer into the centre of the cake, the cake is done when it's internal temperature reaches 98°C (210°F). Once immediately out of the oven, invert the cake pan onto a cooling rack, and let it 'hang' for 15 minutes. Turn the cake pan back on its base, run a knife around the pan to loosen the sides and remove the cake. Allow to cool to room temperature. Meanwhile, if you choose to wash your strawberries, make sure that they are patted very dry with paper towels. Choose 13 (more or less) of the nicest strawberries for decorating the top of the cake. Slice the rest for the filling. Using a hand-held or electric mixer, whisk on high speed until the cream just starts to thicken - you will start to see the whisk lines faintly trailing in the cream as you whisk. Reduce to medium speed, continue to whisk until stiff peaks form.Cover with cling wrap and keep chilled until ready to use. (Note: Be careful not to over-whip as whipped cream goes from soft to stiff very quickly – over-whipped cream will start to turn buttery. If this happens, you will have to start over with a fresh batch of cream). Slice the sponge cake into 3 layers. Spoon some Chantilly cream onto one layer and spread evenly. 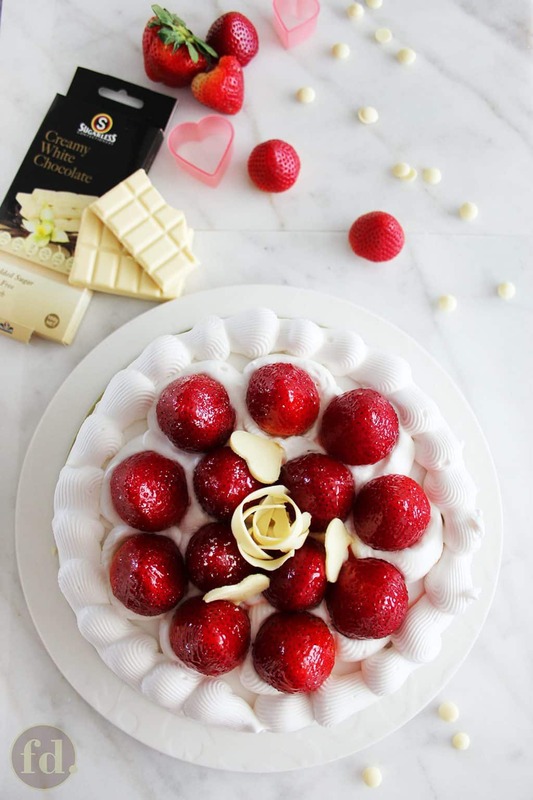 Arrange half of strawberry slices evenly over the cream,leaving the edge of the cake clear by half an inch (1-cm), and top with enough Chantilly cream to cover the slices. Place the second sponge layer on top. Spoon some Chantilly cream onto the second layer and spread evenly. Arrange the remaining strawberry slices evenly, leaving the edge of the cake clear by half an inch (1-cm). Top with enough cream to cover the slices. Finally, place the third layer on top. Spread enough Chantilly cream to cover the top and sides of the cake, reserving some for decorating. Transfer the remaining Chantilly cream to a piping bag fitted with a tip of your choice. Pipe a border all around on top. Decorate the bottom of the cake with a border of white chocolate curls, if desired. Chill the frosted cake in the refrigerator for at least an hour before serving. When ready to serve, arrange whole strawberries in the centre of the cake. Sprinkle remaining white chocolate curls over the strawberries, if desired. Hi Rudolph, I’m not sure where you reside, but here in Singapore, we can get these readily available in most supermarkets. I’m afraid there really isn’t a substitute for Hong Kong flour, and the next best option I could think of is to use cake flour. I’m sorry if I can’t be more helpful. celia lim i have a question for you where can i purchase optima spounge mix and hong kong flour from i have a hard time finding these two items locally can you help me thank you. hello celia i want to try your cake recipe it sounds terrific i can’t wait to try it,celia I was wondering where can you find optima sponge mix from and hong kong flour may you help me with this I appreciate this very much and thank you so much. Hi Joanne, thank you so much for sharing! I’m so glad your cake was enjoyed so greatly. It sounds like the whipped cream may not have been whipped long enough to stiff peak consistency. You’ll need to whisk until the cream stays firm on the whisk, and the end does not droop back on itself. If you did whip the cream sufficiently, I think it helps to chill the frosted cake overnight in the refrigerator, to allow the whipped cream to set and firm up a little. In fact, I usually prepare and frost this cake at least a day before I intend to serve it. It will firm up nicely, the flavours will come together better, and it will slice neatly if it’s kept chilled right until the time you need to serve it. Hope this helps! Hi Celia, thank you for your wonderful recipe. My family enjoyed it greatly. However, the cream was not as firm as I like as it was quite messy slicing the cake. Perhaps I did not whisk it long enough? Can you please advise how long should I whisk it for. Hello Eileen, I’m so excited you’re thinking of giving this recipe a try! You can use vanilla extract instead of butter oil, butter oil is like an intense butter-flavoured extract. I really hope this one works out for you! ?Happy baking! Hi Celia, chance upon your recipe while “mouring” over my failed attempt(2x) with other recipe. Will definitely try yours! Btw, what’s butter oil, can i substitute with vanilla extract or melted butter? Hi Forest, thank you so much for taking a chance with this cake recipe. I’m so very glad to hear of your success and that everyone liked it! Congratulations! Have a wonderful weekend! I tried this! I’m a noob in baking and glad I succeeded! Everyone says it’s good! Hi Bel, exciting stuff! Just to be clear, are you thinking of baking one 11-inch sponge to slice into two layers, or two 11-inch sponge cakes to make a two-tier cake? If it’s just to make one 11-inch sponge, I’d recommend doubling the recipe only because it’s easier to work out the weights and measures, and in my humble opinion, better to have more cake to work with than less (plus,I usually have eager mouths to eat the extras in my home…heee). Hi Celia, im thinking to use this sponge cake recipe for a 11″ base as part of a 2 tiered birthday cake. Could you advise on the recipe needed and how do i increase it? Hello Denise, thank you so much for the glowing feedback on this strawberry shortcake recipe! It really makes my day whenever I hear from readers like you who try these recipes, and then take the effort to let me know how it turns out. I’m so thrilled you found me on my blog too! Ooooh… really rich chocolate cakes are my fave, believe it or not, and I’ve tried a couple of recipes that I really enjoyed but just haven’t gotten around to posting. I will surely try to get one or two of my favourite recipes up on the blog soon. Stay tuned, okay (better still, subscribe for free to get recipe updates whenever I post). Am definitely in with green tea cake suggestions too! I hope you’ll keep your comments coming whenever you try any other recipes here. I’d love to hear from you! Have a wonderful weekend ahead! Chanced upon your website and I’m super happy that I did!! This is truly THE STRAWBERRY SHORTCAKE RECIPE!! The sweetness is just right and the cake is so so soft! Best of all, it doesn’t have any egg smell (most sponge cakes do no matter how much vanilla essence I add)! Thank you so so much for sharing this recipe, I’ve tried so many before but none of them come close to being as good as this! I’ve made this at least 3 times and all my friends and family loved it! water – 56 gm; vegetable oil – 70 gm; sponge cake mix – 113 gm; Hong Kong flour – 56 gm; caster sugar – 64 gm. I’ve updated the recipe to list weight measurements in grams as well, but just in case you’re reading a cached copy of this post, I’m listing them in this reply. I’m so excited you’re baking this for your son, hope this turns out awesome! I’d love to know and please don’t hesitate to ask me anything about this recipe. Happy baking! I am thinking of baking this cake for my son’s 10th birthday as he simply loves Japanese Strawberry shortcake. Would it be possible for you to indicate grams next to the oz measurement please? I am not family using oz and thus afraid that the conversion will be inaccurate. Hi Cy, the ounces are weight measurements. I’ll be sure to make that clarification in the post. Thanks for asking! Is the oz in volume or weight? Hi Shirleen, I usually finish this cake a day before and let it chill in a closed cake box or cake container in the fridge overnight so that the cream filling and frosting firm up nicely. How long the cream stays firm really depends on the environment, I’ve delivered this cake by car for 25 mins journey (air conditioned, of course?) and it held up well. I always make sure that when the cake reaches it’s destination, it goes into a chiller there until when needed. I’ve had friends take home slices in air tight containers by MRT for 45 mins journey and it was just getting soft, but not drippy. The key is have the cake chilled really well, for instance, my fridge temperature is usually 3 deg C. Hope this helps!? i was thinking the transporting the cake from 1 plae to another. will the cream start to melt fast n easily? Hi Bel, I’m so thrilled! You did it!???? thanks so much for giving it another try and for sharing!?? Glad to hear your family loves it! Hi Celia, i tried baking this cake and it turned out to be a success this time. My family loves it too ? the sponge cake was really good. Hi, i tried your recipe and the cake turned out to be quite damp. When i tried using a cake slicer to slice the cake, the cake split apart so i couldnt use it. Is it supposed to be very damp and should i use a knife to slice instead? Will want to try it again. What inch of cake pan did you use? If we use Redma. top whipping cream, dont need to add sugar? Thank you so much, glad to hear he enjoyed it!??? My fussy husband has nothing but praises for your yummy cake …. which he seldom does. Hotel standard he says. Thanks again ? Thank you so much, Philyn, for your awesome comments! Glad you enjoyed it!???? This is the best cake ever! Simply delicious! The cream is wonderfully light and sweetness is just right. The sponge texture is perfect too! Yummy! Thanks so much, Joan! Hope you do!?? Your description makes me drool -will try it when I m back! Thanks for sharing.